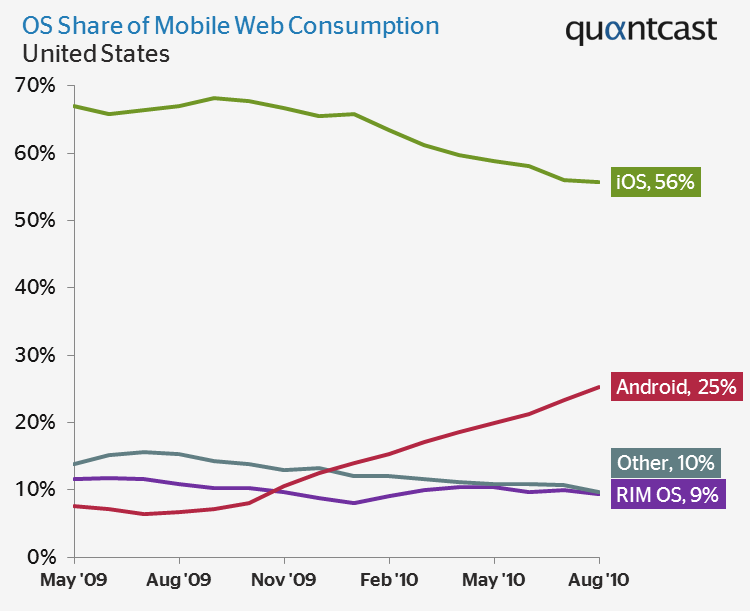 The use of Google Android (s goog) devices to access the web continues to rise in the U.S., at the expense of Apple’s iOS (s aapl), BlackBerry (s rimm) and other handset platforms. Quantcast, a San-Francisco-based web measurement company, today offered this data, indicating that Android has a 25 percent share of mobile usage, up from around 10 percent last November. Apple’s iOS platform, which powers the iPhone, iPod touch and iPad, currently stands at 56 percent, down from a peak of nearly 70 percent at the end of 2009. Normally with this type of data, I’d look into further comparison between Apple, Google and everyone else in the mobile space. But something else stood out when viewing the Quantcast data — Google comes out a winner both today and in the foreseeable future due to mobile search. The main source of Google revenue is indeed search, but the real growth is in searching for data away from the desktop. Google knows this, so it continues to invest heavily in its Android platform. This is also a main reason why it makes the platform attractive to handset makers by giving it away. As Android device sales continue to grow on a faster pace than competing products, more mobile devices that primarily use Google services are in the wild — each one of them a potential money maker for Google through search and ad revenue. Here’s the funny thing though — Google has been winning such revenues in the mobile space even before Android. All of those iOS devices that Apple has sold, more than 120 million Steve Jobs said this week, come with Google as the default search engine. Might some consumers change their default search? Of course, but I doubt a statistically significant number actually do. It’s only when a carrier or competing search brand enters the picture, just as Verizon (s vz) did last year when it changed over to Bing on BlackBerry devices. Essentially, Google has benefitted from mobile search since the iPhone launched in 2007 with Google as the default search engine. But now the search giant is outselling other mobile platforms, and even if Apple removed Google as an available search partner at this point, it would be a temporary setback for Google’s mobile search revenues. Google has had the mobile search market cornered from the beginning, and with Android’s usage growth, it stands to keep that market for some time to come. Well, at least until we see how Microsoft’s upcoming Windows Phone 7 (s msft) platform does — surely it will use Bing as the default, no? I was blind, but now I see. After enjoying Android, and specifically HTC Sense, I would never go back to clunky iOS. Sure they now have multitasking like Android, but how long will Apple take to make widgets and things that make Android so user friendly? years methinks. My god, steady growth since day one of its release, how does one explain that. LOL, yes sarcasm is high. Android just rocks. Its ok Jobs dont cry man, it will be ok. Hey maybe you can make like an iPacifier or something, and charge $100 for it. You article is misleading, this in not iOS vs. Android, it is iPhone vs. ALL MOBILE PHONES THAT RUN ANDROID OS. iPad and iPod touch have been excluded although they run iOS making the whole comparison mute. Also the ACTIVATIONS for iOS and Android are almost the same at +/- 230K, Android growth in context is nothing to write home about. While search will always be there,Apps are becoming more important often being the first to be launched when people are looking for certain services be it news or products. With Apple running their own Ad service and RIM looking for their own (Microsoft will surely have their own), Google will soon dread the day they decided to compete against device manufactures instead of partnering with them. The data is for web access(primarily Apps) and not mobile search. I would be careful to draw conclusions about search from this data. Perhaps you should look into metrics of how many of those usage hits are actually from search. But it is clear that Android is filling in a vacuum that would have been left open for iOS to grab. when Google abandoned net neutrality I switched my default search on iPhone to Bing. So far, no downside. And what is Bing’s stand on net neutrality sir? One question I have much money google really makes from mobile search. If you try out google search on the android or iphone, you “may” get a “sponsored link” at the top, but then you get the search results. You don’t get the adwords/adsense based ads on the right hand side as in a desktop search. Now of course the sponsored links will bring in money. But didn’t google make more money from the ads on the right hand side of search results? (I agree the mobile ads ala AdMob will always bring in money for them but that is not an area where they have 65% market share.) So how much are they really making ? Eric Schmidt recently said they are making more than enough to cover their expenses. But will it be like their current gold mine ?